*Disclaimer: I follow Abel’s blog, which features a weekly series of posts on dating widowers, and I am a member of his Facebook group, Dating a Widower (DAW). I am a fairly active contributor at both venues as they center on a topic related to widowhood (which I have been) and dating/remarriage related issues surrounding widowers (my husband Rob was widowed too.) To disclaim (protest?) further, I contributed an essay to this book that Abel included, which is why I received a copy of it. End of disclosure. I discovered Abel and his blog via a list of widowed bloggers on the web link page of yet another widowed blogger in the webosphere of all things grief and gloomy. The web is choked with widowed folks these days, sharing their stories, building platforms for support groups/organizations, launching book careers off the backs of uplifting memoir and even hosting conventions for widowed to gather and network. Yes, even in mourning, we still network. Abel’s blog and posts stuck out from the crowd for me because, while many of the bloggers/writers in the genre focus on the grief process with its irritations, perceived indignities and sometimes actual problems/issues, he wrote about moving on, and he did it in practical, no-nonsense terms that make sense. A blogger for over a decade, Abel’s focus via the Widower Wednesday series, a q&a column for women who are in relationships with widowed men and find themselves dealing with problems that aren’t covered by the women’s magazines and self-help literature, came about as a result of Abel responding to the specific concerns of readers who were flooding him with emails, hoping for advice and a peek into the widower’s mindset where moving on into a new relationship was concerned. Widowhood is not divorce, and many women find they have no frame of reference for issues that are bereavement driven. They also sometimes wonder if the issues they are struggling with are actually grief issues at all. In addition to the blog, Abel also began hosting a peer-to-peer group on Facebook where women who are in relationships with widowers could gather privately to exchange stories, vent, seek insight and encourage each other. The emails, blog posts and DAW group eventually became the basis for the Dating A Widower book. The book itself is a nuts-and-bolts look at moving on, dating and remarriage when widowhood is at least half the equation. Each chapter deals with specific problems/issues that are common concerns and illustrated with stories of real women and how they’ve coped. Although it might appear that the point of view is primarily from the male perspective, the gender perspectives are quite evenly balanced and Abel allows his contributors to share their insight and hard won wisdom, allowing the reader to take what they want or need from each chapter. At 114 pages, it’s a quick and comprehensive read. Abel shares his own story, culminating in his remarriage 15 months after the death of his first wife, and his now wife, Julie, contributes her perspective as well, which provides a welcome “other side” that most relationship stories don’t provide. They both write from the heart, and their story provides a good model for any “mixed” marriage couple to follow. 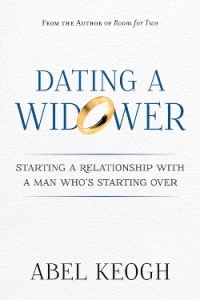 There is even a chapter written specifically for widowed people who are, or are thinking about, dating. Given the dreadful lack of literature dedicated to widowed folk who are past active grief and looking to move on and remarry at some point, this is a welcome – and well done – addition. If a reader is looking for a book that validates the idea that widowers are not first men but fragile souls in need of rescue or retraining as though they were wet behind the ears pups, this is not that book. Instead, it reminds the reader that the widowed man is a man first and always and a bereaved spouse second or even farther down the list depending on his personality and responsibilities. It also emphasizes the basic bit of dating knowledge that all women should have tattooed on themselves somewhere that it’s easy to see and read, “a man who loves you will move mountains to show you how he feels and a man’s actions are worth more than a thousand of his words”. So, if a reader wants straight answers, practical and applicable advice and compelling real life stories she can relate too – this is just the book you’ve been searching for – so far probably in vain. Dating A Widower – Starting a Relationship with a Man Who’s Starting Over by Abel Keogh is available in several formats and more information can be found here.